So, did you ever thought you’d rue the day they invented hot dogs? By now perhaps you are scratching your head and question – why, why, why. Well, since today is National Hot Dog day–why would anyone celebrate a day about a tube of chicken, beef and pork–rolled together in a skin and saturated with preservatives? Hot dogs are as American as it gets. Who can’t remember their first hot dog? Who can’t remember their first hot dog at a baseball game or football game? Who can’t remember hot dogs for dinner; hot dogs for lunch; hot dogs on buns; hot dogs on a plate; hot dogs with ketchup or hot dogs with mustard; who can’t remember hot dogs at Grandma’s or hot dogs at home? You see hot dogs are an integral part of our life. Like its’ cousin the hamburger, we’ve grown up on these things. We call them ‘comfort food’, but realistically they’re just easier to enjoy —and digest! Variations of the hot dog at ball parks all over the United States include Italian sausage, bratwurst, southwest sausage, smoked sausage as well as several others. . .all of them draw upon the area where they are made, cooked and served. A southwest sausage on a bun does REAL well in Texas but not so much in Massachusetts! Hot dogs have withstood the tests of time, and whether you’re favorite is Oscar Mayer, Ball Park Franks, Der Wienerschnitzel or whatever your hot dog of choice, they are still one of our country’s favorite ‘snacks’ or late nights meals. . .especially after a night of partying! 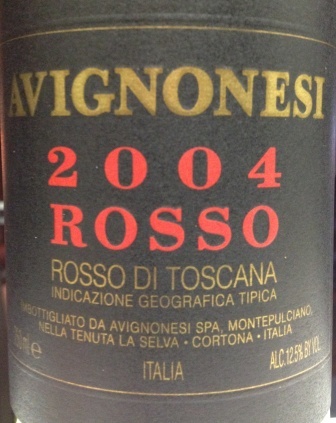 Tonight we opened another Twin special buy and at less than $15 a bottle we enjoyed a 2004 Avignon Rosso di Toscana. . .it’s advanced age, while a little bit of a concern, was soon dismissed as an opportunity for a nice tasting Italian wine. From our friends at Cellar Tracker.com, “The dirt, the vegetables, the sour cherry, and most definitely the acidity…it’s all there. This has a mild oak influence going on as well. For most this will be a food wine, unless you really are a big fan of this style, in which case you might find this medium bodied rustic Italian, a decent house wine.” We both felt that the wine, while tasty, left something to be desired. . . not that we’re complaining; ultimately, this wine came down to selection, price and location! Good wine. . .yes. Great wine. . .no. Bondy Deck Wine. . .not happening. Thanks for reading and remember to enjoy your favorite wine responsibly and remember to recycle whenever possible.